The gender expert Tamara Martseniuk prepared the new interview from the series “Women Human Rights Defenders, Who Change Ukraine”. 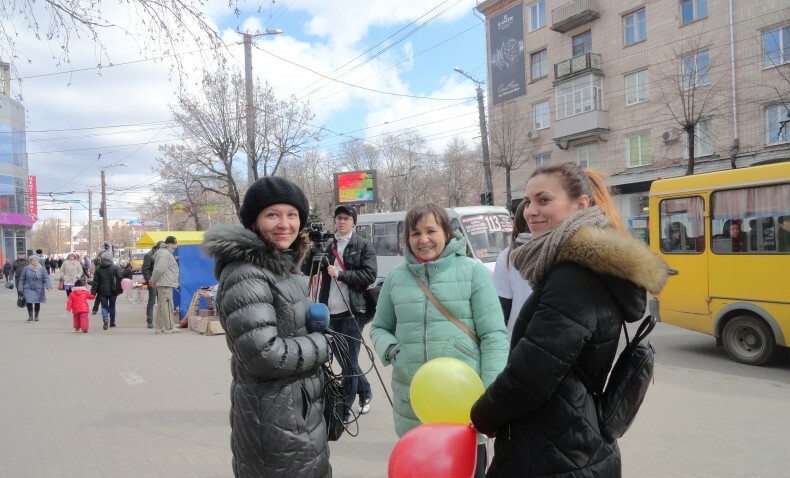 Inha Dudnik, Executive Director of the NGO “Territory of Success” from Kropyvnytskyi, a member of the Ukrainian Helsinki Human Rights Union, answered the questions. – Please share your history of involvement in the human rights movement in Ukraine. Why did you decide to work in this field? – It is hard to say what was the starting point and when I understood that the values, which I lived, are human rights. At first, I thought that my life has led me to this path by some unexplored, almost mystical ways. But now I realize that it could not be otherwise: everything that happened to me was just logical From the beginning, I was working at school, was a volunteer at the children’s environmental NGO “Flora”, which attracted children to environmental activity, and worked with “difficult” children. Then I became a leader of several human rights projects on a professional basis because I found fulfillment in work. Later, we realized that there are much more problems and they are much deeper; it is just impossible to resolve them within a children’s organization. Therefore, the NGO «Territory of Success” was established. When in 2008 we created it, we already knew what and how we deal with. There are some people who for many years working on issues of human rights and they became my teachers and leaders. These are Yevhen Zakharov, Oleksandr Stepanenko, Oleksandr Bukalov and Volodymyr Yavorskyi; they became my mentors, whose opinion is always important to me. – Where have you got education and knowledge of human rights? – I have pedagogical and economic degrees, but they are not even tangent to human rights protection. So all my education in human rights is informal. The first significant educational step in this direction was the Fifth School on Human Rights, which was held by the Kharkiv Human Rights Protection Group. Among the many training sessions, I would like to highlight the training on Domestic Violence Prevention for UNDP Equal Opportunities and Women’s Rights in Ukraine Programme and training at the Danish Institute for Human Rights. – What is your area of focus in the field of human rights? – All human rights topics are very closely related! My professional interests are topics of access to information, protection of privacy, freedom of movement, implementation of socio-economic rights and prevention of torture and ill-treatment. The issue of non-discrimination and equality in social and economic spheres is tangent to these topics. – Did you work with the theme of women’s rights? – I worked with the protection of victims of domestic violence. For any human rights, it is important not only to help a particular victim of human rights violations in a particular situation but also to help to create mechanisms to protect rights. So after the Law of Ukraine “On Domestic Violence Prevention” (2001) entered into force, it was very important to make it work. We had to work with people, which the state put on duty to prevent and protect victims of violence. Since 2010, we had held more than 50 trainings for police officers. We carried out preventive educational activities in the field of education: schools, institutes of I, II, III and IV levels of accreditation. Our lawyers actively advise women – clients of social centers. – In your opinion, what are the greatest successes of the human rights movement in Ukraine? – Today the human rights movement in Ukraine is visible and every day becomes a more powerful player. It happens slower than we would like, but Ukraine moves forward. Human rights defenders’ undeniable success is the creation of the national preventive mechanism. – What are challenges of the modern human rights movement in Ukraine? – The most important challenge is the war and everything connected with it. But there are also many issues not directly related to hostilities – they lie in the plane of customary law, people find it difficult to abandon paternalism and consumer psychology, to take responsibility for their own lives. The reforms are made, unfortunately, mostly to create an appropriate image internationally, but not for real change in society. And the further from the center of the region, the more obvious these problems are. – In your opinion, is it enough attention paid to gender issue by the human rights movement? – I will not make a mistake if I say that in the modern world it is impossible to separate the issues of human rights and gender equality. That’s why I think the human rights movement pays enough attention to this issue. – Gender-based violence is a serious problem, particularly in Ukraine. In your opinion, what should be done to improve the situation? – The Council of Europe Convention on preventing and combating violence against women and domestic violence (Istanbul Convention) should be ratified as soon as possible. It is necessary not only to match her legislative acts of Ukraine but also provide effective mechanisms to respond to manifestations of gender-based violence, implement best practices of corrective work with aggressors, a policy aimed at developing a society of zero tolerance for violence. – What or who inspires you the most in your human rights work? – Youth and like-minded people.